After starring in UK feature film 'The Flirting Club,' Richard Di Gregorio bursts back onto the Melbourne stage in one-man variety show 'Richard Di Gregorio: On Time.' He explores our relationship with time and what happens when Mr 20-Something wakes one day to find he's 33. A mix of stand-up, storytelling, music and even a short sitcom, the show is intelligent, fast-paced comedy. How do we perceive time? Does it sometimes trick us? And how many shopping days left until Christmas? After winning their way into 2010’s Short & Sweet Gala, Richard Di Gregorio and Keith Gow team up again as actor and writer to explore these questions and more. Gow's script deftly weaves Di Gregorio's personal – sometimes VERY personal – stories with reflections on the nature of time itself. Di Gregorio is a man of many talents. A natural storyteller, he also sings, raps and plays guitar during the show, and has even had a feature film script optioned (co-written with director Chris Broadstock). 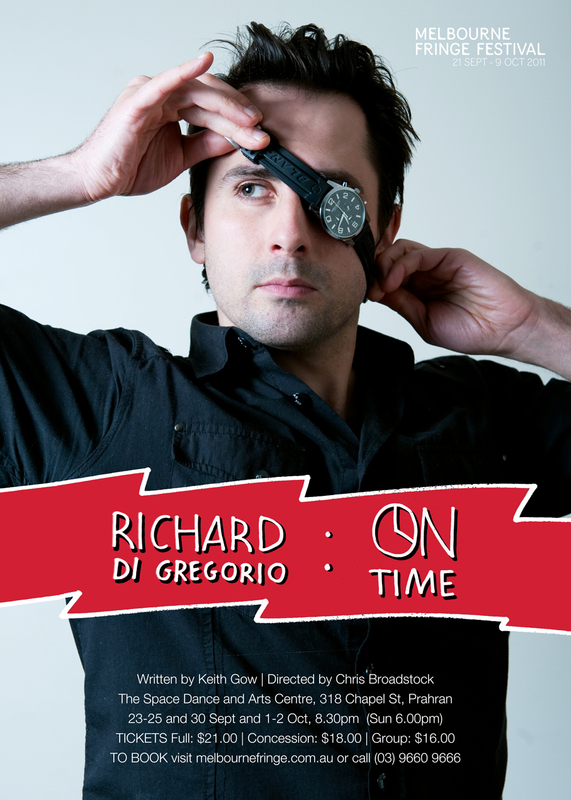 He also stars in the short sitcom ‘Time and Space’ which the audience is treated to halfway through ‘Richard Di Gregorio: On Time.’ Ever wondered what Time and Space would look like as sitcom characters? Or what actually happened that infamous night Richard met Billy Crystal? Wonder no more! Di Gregorio’s charm and energy tie together the entire performance and carry the audience effortlessly through this sparkling hour-long variety show. ADELAIDE FRINGE FESTIVAL ON SALE NOW!